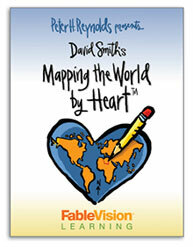 Mapping the World By Heart is both a curriculum and a consulting service. See links to the left for details on the curriculum and on program offerings. Learn about the author's consulting services, including workshops, school assemblies and author visits, in-service programs for teachers, curriculum audits, website evaluation, and credit-bearing summer institutes. David Smith travels the globe sharing his enthusiastic and innovative approach to teaching and learning about our world community. Click the cover to read about and order the new edition from Fablevision. Many people have asked about replacement map sets, or about how to get sample pages from the program. Please point your browser to the website of the publisher of the curriculum, Fablevision and at the bottom of the page you will see an option to order a replacement set of maps, and below that, a link to email Fablevision for sample pages, or for further information.